Okay, well in my efforts to change up my workouts, I got brave and tried yoga! 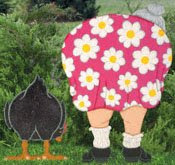 The fat grandma in the garden was all I could think about while holding that pose, so needless to say I didn't "find my center"...I was too busy trying not to laugh out loud or fall on my face! Stay tuned...who knows what I will try next! I am really enjoying Body Step (which is very different from regular step aerobics)! What is your favorite exercise??? We might have the most laid back calico kitty on the planet! 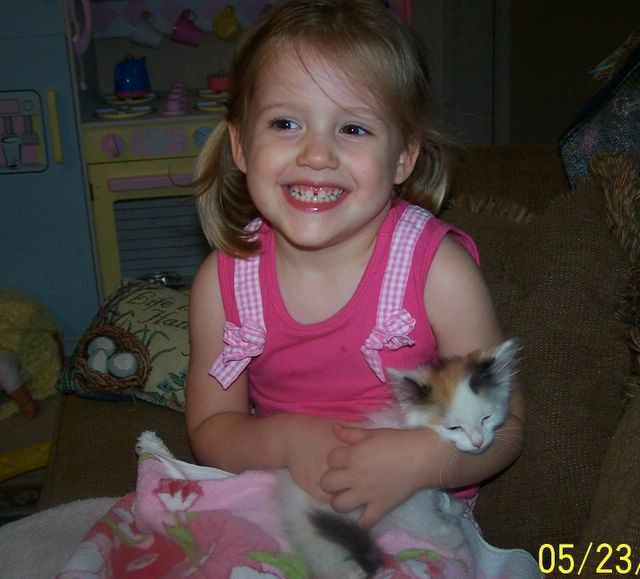 When we got Patty two years ago, she was very tiny and Kirstyn loved and loved on her. She is so patient with both Kirstyn and James. Kirstyn is always carrying her around and recently James has started snuggling with her. If she is laying down napping, he will go over to her and pat her soft and then lay his head down on her. She will just lay there and let him touch her and love on her. Now, if you ever stop by our house to meet Miss Patty, you may not get the chance because she is not as open with strangers, but I am really thankful that she is so kind to my kids! We love you Miss Patty! Just call me FRUSTRATED! I maintained....that means I lost 0, nothing, nada! Ugh! That would be perfectly fine with me some weeks when I have been not behaving myself with my eating or not exercising, but when I have been following the plan AND exercising, then it upsets me! I mean I was so proud of myself this weekend. Kirstyn went to two birthday parties, one on Saturday and one on Sunday and they both served pizza and cake and I did not have a single bite of either one! So, here we go, on to another week of this. I really hope I get some good results next week on the scale to motivate me through our vacation! 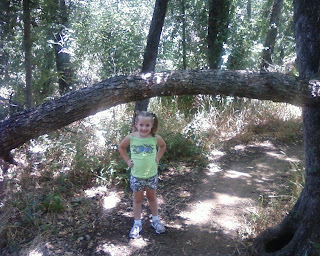 This week Kirstyn got to attend River Legacy Nature School. The class she took was called Hide and Seek. 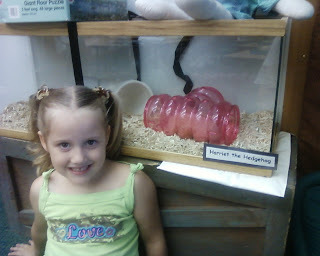 She learned all about animals that hide in the wild from the predators to keep from being prey! 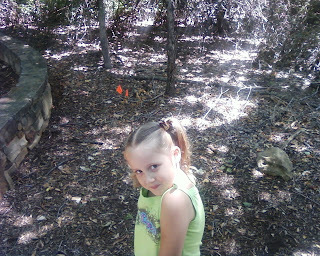 To quote her on Monday they saw "a real, for real opossum, really!" Also, Harriet the Hedgehog lived in her classroom. Every day they had an animal visitor, did a craft, went on a nature walk, and had a "themed snack" (today's snack was goldfish and gummy worms!). 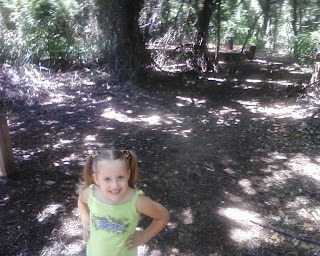 Today after school, she took Daddy on a nature walk and he snapped a few pictures with his cell phone. 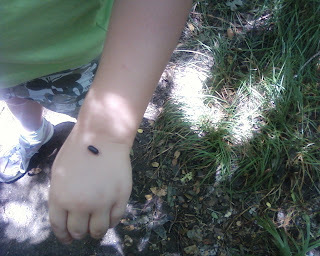 Meet 'Sassy, the RollyPolly'. Apparently, Kirstyn found Sassy in the same spot each day and took care of and talked to her, so it is only fitting that you meet her too. Oh and STAY AWAY from the red flags, they mean "Poison Ivy Present" and that will make you "itch forever"! She had a very fun and exciting week and she is already asking if she can go back next year! Next week will be busy too....it is VBS week! Okay, so today's weigh in was for 2 weeks and I have to say that I am disappointed. My weight loss was only 0.6 but at least it was a loss! The good part is that this week for the first time when I look at myself in the mirror, I am seeing a loss! I expect next week to be a big loss since I have been sticking to plan and I know from doing this for so very long that it doesn't always show up immediately. That is also true when you have been cheating...sometimes it takes a couple of weeks of "getting away with it" before it shows up...but it will! Today in our meeting we talked about what has worked for you and what hasn't worked for you! For example, what has worked for me is journaling everything I put into my mouth and having a variety of fruit on hand and ready to eat (like washed grapes in a bowl in the refrigerator or apples out on the counter). Blogging is also working for me! What hasn't worked for me is having on hand low point cookies and low point chips because I tend to overeat those! Tell me, what has worked for you? We had a rather delightful Daddy Day at our house! Kirstyn started the day off by really making David's day. She snuck into our room and woke him up with a kiss and said "Happy Father's Day Daddy". He smiled really big and the look on his face said that no matter what else happened, he was going to have an amazing day! She then came to my side of the bed and told me I needed to hurry to get up because Daddy NEEDED Happy Pancakes! Of course David agreed with her so I had to get moving! I think his favorite present was this picture of the two of them that she had drawn. I think it really looks like them...what do you think? We went on to church and Sunday school and Daddy was awarded many gifts that included hand prints and foot prints and of course a big handful of Hershey's "hugs and kisses"! After church we met Mimi and Grandpa for lunch so David could treat his dad to lunch and so Kirstyn could give Grandpa his card and present. She really loves to give gifts and make cards! We also called Pappy to tell him Happy Father's Day and Kirstyn even sang to him! After we got home from lunch Kirstyn and James gave David a new golf bag and then they 'helped' him organize it! James spent much of the afternoon grabbing golf balls and squealing and running away with them. Kirstyn wanted to know why he had so many of her corn sticks in his golf bag (long story, but you know you are a red neck if...golf tees make great corn on the cobb holders). Oh and I have to show off this cute bow tie Kirstyn made for David and well, since I didn't do a Mother's Day post I thought I would show you my "Thumbbody Loves You" flower pot that Kirstyn made for me that is now blooming like crazy! I am very proud of myself for taking care of it so well that it is actually flowering. I have to say that Kirstyn is pretty proud of me too! I could not have asked for a better husband and father for my children! David really is amazing and I love watching his and Kirstyn's relationship. She is such a Daddy's Girl and he loves it! Wow, I have been reading this blog for a while now off and on and I just sat down to catch up and I am overwhelmed right now by how incredibly amazing this family is and how strong their faith is. Grab a box of tissue and start reading! I am also hugging my children tighter and telling my Jesus thank you for all that he has blessed me with! If you have not taken time to read this blog, you have to stop by and spend some time reading the story of Audrey Caroline. You know, my first encounter with Selah was as a worship band at a Beach Reach mission trip I went on in college. David and I have always been fans of their music and have purchased almost all of their CDs, but knowing all of this about this family makes me an even bigger fan! Update: After posting this, I realized that I have been very open about the fun I have with my kids and my darling husband and even about my weight loss journey, yet I haven't shared much about my faith or any of our trials that have made us the people we are today. My struggles are meager in comparison to this story, but at the same time they are mine and they are part of what makes me who I am today. 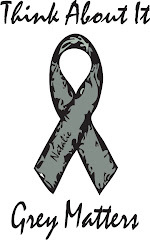 Before we had Kirstyn and then James, I lost a baby to miscarriage. It was very hard for me and I remember even before there were signs that I would lose the baby I was overwhelmed by the Spirit of God telling me that I needed to remember that this baby that was in my belly was not mine but HIS. I remember falling to my knees and begging my Jesus to let me keep and raise this baby that I was carrying but if that wasn't His Will then I would embrace that knowing that His Peace would carry me through that difficult time. After that time of prayer, David and I talked and decided that for each child we had that we would pick a Psalm to be that child's Psalm and we would teach each of our future children their Psalm because the Bible promises us in Isaiah 55:11 that His Word will not return void. Our first baby who we have nicknamed "Sweet Pea" was assigned Psalm 63. O God, you are my God, earnestly I seek you; my soul thirsts for you, my body longs for you, in a dry and weary land where there is no water. I have seen you in the sanctuary and beheld your power and your glory. Because your love is better than life, my lips will glorify you. I will praise you as long as I live, and in your name I will lift up my hands. My soul will be satisfied as with the richest of foods; with singing lips my mouth will praise you. On my bed I remember you; I think of you through the watches of the night. Because you are my help, I sing in the shadow of your wings. My soul clings to you; your right hand upholds me. They who seek my life will be destroyed; they will go down to the depths of the earth. They will be given over to the sword and become food for jackals. But the king will rejoice in God; all who swear by God's name will praise him, while the mouths of liars will be silenced. Kirstyn's Psalm is Psalm 40. I patiently for the LORD;he turned to me and heard my cry. 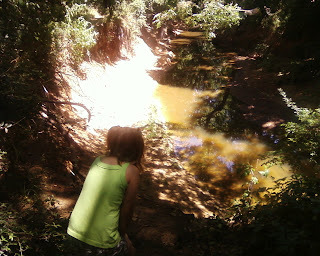 He lifted me out of the slimy pit, out of the mud and mire; he set my feet on a rock and gave me a firm place to stand. He put a new song in my mouth, a hymn of praise to our God. Many will see and fear and put their trust in the LORD. Blessed is the man who makes the LORD his trust, who does not look to the proud, to those who turn aside to false gods. Many, O LORD my God, are the wonders you have done. The things you planned for us no one can recount to you; were I to speak and tell of them, they would be too many to declare. Sacrifice and offering you did not desire, but my ears you have pierced; burnt offerings and sin offerings you did not require. Then I said, "Here I am, I have come—it is written about me in the scroll. I desire to do your will, O my God; your law is within my heart." I proclaim righteousness in the great assembly; I do not seal my lips, as you know, O LORD. I do not hide your righteousness in my heart; I speak of your faithfulness and salvation. I do not conceal your love and your truth from the great assembly. Do not withhold your mercy from me, O LORD; may your love and your truth always protect me. For troubles without number surround me; my sins have overtaken me, and I cannot see. They are more than the hairs of my head,and my heart fails within me. Be pleased, O LORD, to save me; O LORD, come quickly to help me. May all who seek to take my life be put to shame and confusion; may all who desire my ruin be turned back in disgrace. May those who say to me, "Aha! Aha!" be appalled at their own shame. But may all who seek you rejoice and be glad in you; may those who love your salvation always say, "The LORD be exalted!" Yet I am poor and needy; may the Lord think of me. You are my help and my deliverer; O my God, do not delay. James' Psalm is Psalm 91.
disaster will come near your tent. For he will command his angels concerning you to guard you in all your ways; they will lift you up in their hands, so that you will not strike your foot against a stone. You will tread upon the lion and the cobra; you will trample the great lion and the serpent. "Because he loves me," says the LORD, "I will rescue him; I will protect him, for he acknowledges my name. He will call upon me, and I will answer him; I will be with him in trouble, I will deliver him and honor him. With long life will I satisfy him and show him my salvation." When I pray for my children, I often pray these scriptures for them. When I worry about my children and their unknown futures, I often read and meditate on these scriptures. When all I could do was curl up in a ball and cry when we found out that I would lose Sweet Pea, David would sit and read his Psalm to me. At the beginning of my pregnancies with Kirstyn and James these Psalms became a way to calm myself and stop worrying about the unknown. God has also used this story of mine to minister to several of our friends that lost babies after us and I pray that He will continue to use me to help others. Do you pray scripture for your children? I will miss you bloggy land friends. We are leaving today to go out of town and to get Miss Kirstyn back from my mom and dad! I won't be posting a Tell All Tuesday, but don't worry about me, I plan to stay on track! I even went to a Body Attack class this morning early so that I could get in one more workout before we left! 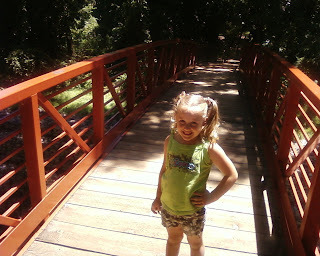 I am taking my tennis shoes and plan to spend some time with Kirstyn in a paddle boat out on the lake! Yeah for fun workouts. So, I will see you next Thursday. Have a great week! YEAH! My hard work at the gym is paying off! I weighed in this morning and lost 3.4 lbs! I feel very deserving of this big loss after the many hours I have spent working out. As a matter of fact, I went yesterday morning to a step aerobics class and then went back last night for a Body Attack class. So, I put in 2 hours of hard cardio yesterday! Yeah me! Okay, so where does that put me as far as my 20lbs by 4th of July goal? I have 12 more pounds to loose. Realistically I may not make it but I plan to get VERY close!!! When I started this Tell All Tuesday 8 weeks ago, I was just looking for a way out of my weight loss rut. I was gaining and loosing the same 2 lbs over and over. I am now 4lbs lighter than I was when I got pregnant with James (and that weight was my lowest in many years!). What is your next mini weight loss goal? Oh and in other news, today is my 3 year Bloggaversary! Three years ago today I published my first post on this blog! I never would have dreamed that it would become all it has to me and that I would make so many great bloggy friends and weight loss buddies! Thanks for reading!!! Well, this has become a summer tradition already in our family! Every summer since Kirstyn turned 2 she has spent a week during June in Arkansas on the farm with my mom and dad (her DeeDee and Pappy). Last year started a new tradition of a week of swimming lessons while she is there. DeeDee and Pappy have a pool at their house that will provide the opportunity for hours and hours of practice this week during lessons. As a matter of fact, the kids officially 'opened' the pool during Mother's Day weekend! My darling husband got the cold privilege of being the adult in the pool with Kirstyn, my nephew Logan, and my cousin's son Carter! and ON THE ROAD with DeeDee. 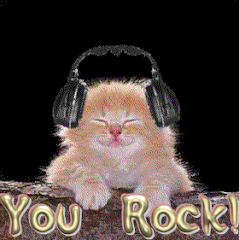 Have a great week Miss Kirstyn! Me: Are you going to miss me? Kirstyn: YES Mommy! And I will cry too! But DeeDee will say, (in her best DeeDee voice) "You will see Mommy and Daddy soon." And then I will stop crying. Me: Okay, just don't give DeeDee too much drama. Kirstyn: I won't Mommy. I PROMISE!